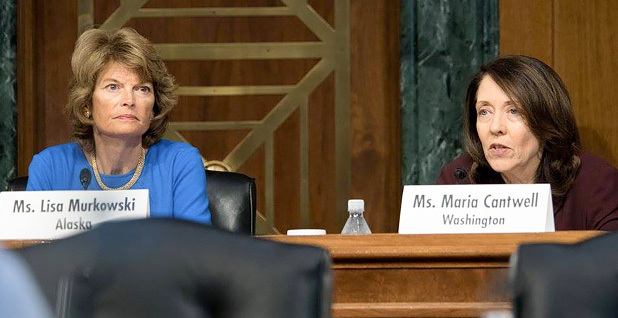 Senate Energy and Natural Resources Chairwoman Lisa Murkowski and ranking member Maria Cantwell are looking to salvage energy reform talks amid House skepticism. Photo courtesy of Senate Energy and Natural Resources Committee. After meeting with Energy and Natural Resources Committee ranking member Maria Cantwell (D-Wash.) and House Natural Resources Chairman Rob Bishop (R-Utah) for more than an hour yesterday, Senate Energy Chairwoman Lisa Murkowski (R-Alaska) told reporters that she's still confident that the conference process will yield a final energy bill that can be signed into law this year. "I believe we are going to get a deal," Murkowski said. "And I believe it will be a good deal." But whether that deal includes language addressing LNG exports and the Land and Water Conservation Fund — both key to the Senate, which passed its energy package with both provisions intact by a wide margin earlier this year — remains to be seen. Cantwell told reporters that staff will continue "trying to close out sections of the bill" but made it clear that LNG exports and LWCF continue to be major sticking points. "I think the issue is that there are things that were big parts of the Senate bill for both sides of the aisle, and I think that people want to see those things," she told reporters. However, with lawmakers reportedly looking to close the curtains on the 114th Congress on Dec. 9, when the latest continuing resolution expires, time is of the essence. "Not a lot of time, we got to get down to brass tacks," said Cantwell. While Murkowski said Tuesday that an agreement would need to be struck this week to allow time to prepare the conference report for floor votes, Bishop signaled to reporters that Dec. 5 is the deadline "for filing purposes." Murkowski signaled another meeting is planned today with House Energy and Commerce Chairman Fred Upton (R-Mich.), who did not attend yesterday's huddle because the House was voting on his medical innovation bill, a top priority for him as his chairmanship comes to a close because of GOP term limits. Also absent from yesterday's meeting was Energy and Commerce Committee ranking member Frank Pallone (D-N.J.) and Arizona Rep. Raúl Grijalva, the top Democrat on the Natural Resources panel. Bishop told reporters that yesterday's meeting focused on issues within his jurisdiction, not Upton's, "which is really, I think, the bigger problem area." He described yesterday's meeting as positive but was also skeptical that talks could wrap up in time. "There's still a pulse going," Bishop said. "It grows fainter each day." However, he noted that the Senate has appeared to move closer to some of the LWCF reforms he's sought as a condition for extending the program. "There's areas we can explore," Bishop said. "To get it done by December 5, so they can file it, it's still a long way from that." Given that LWCF was extended for three years in last year's omnibus, "you could pass a bill without LWCF at all," he added. LNG exports will be a topic of discussion for today's meeting with Upton. The House dropped the provision from its recent counteroffer to the House, and Murkowski and Cantwell reinserted it in the response they sent across the Capitol last week. Upton this week blamed the omission in part on the opposition of Pallone, noting that the House counteroffer mirrored provisions backed by both parties. But Murkowski yesterday noted that the election results had curbed the House's appetite for finishing the energy bill. "I think you have just some on the House side who generally felt we didn't necessarily need to do a bill this year, we can just wait til next year," she said. "I think that was our biggest slowdown." A 'potential vehicle' for drought bill? Talks on integrating a drought package to help California and other affected regions in the West in the energy bill are actively underway, with Sen. Dianne Feinstein (D-Calif.) taking a more active role in the negotiations, Bishop said late Tuesday. At issue is legislation that would tweak operations of California's major water projects that bring melted snow from wetter Northern Califorina to the arid center and southern part of the state. House California Republicans have called for increased pumping to help irrigate farmland and hydrate cities, though environmentalists and most Democrats have said this would violate laws to protect listed species under the Endangered Species Act. "There's a lot of people who keep moving the goalposts on California water, which is frustrating," said Bishop, though he declined to elaborate. "One way or another there needs to be a vehicle to solve that problem," Bishop added. "It's a potential vehicle, it's not the only potential vehicle." The Golden State's GOP members have wrangled with Feinstein on the issue before, saying her solution, S. 2533, would not provide significantly more water to farmers. "I'm very pessimistic," said Rep. Devin Nunes (R-Calif.), whose district's farmers have clamored for more water in the state's drought. "We may be able to get some language before the end of the year, but is it going to produce any water? Probably not much." "What they'll agree to is not legislation that actually works," he told E&E News. California is entering its sixth year of drought. Feinstein has said that her bill, which provides funding for water conservation projects and allows for short-term operational changes, would have a better chance of passing the Senate than House GOP language. Rep. Jared Huffman (D-Calif.), a foe of efforts to divert water from environmental purposes to human uses, said he would expect any attempts to do so would be opposed by Northern California members, some senators and the White House. "I'm confident that we have champions for the Endangered Species Act, and the Clean Water Act, and state water law in the Senate and in the White House, and we're not going to see this stuff prevail," he said.